Some of the most common problems people face with their hair in the winter is dry ends/split ends, cold-induced frizz, dry scalp, static, limp hair, dull-colored hair, and the ever dreaded hat hair, according to DJ Quintero, Stylist at Serge Normant in New York City. Think all hair handles winter damage equally-think again. Those with thin/fine hair or color-treated hair are more prone to breakage in the winter. The best thing you can do to keep hair silky and shinny is to moisturize with hydrating shampoos and conditioners. “Remember your hair is an extension of your scalp. Keep your scalp moisturized,” says Quintero. Want to really give your hair star treatment?- Quintero recommends rich hair treatments like Kerastase Masque Nutri-Thermique, $60. Great for all hair-types but especially those with dry and sensitive hair, this masque contains nourishing agents to prevent dehydration. Using an anti-frizz volumizer is key to keeping winter’s harsh ways at bay. 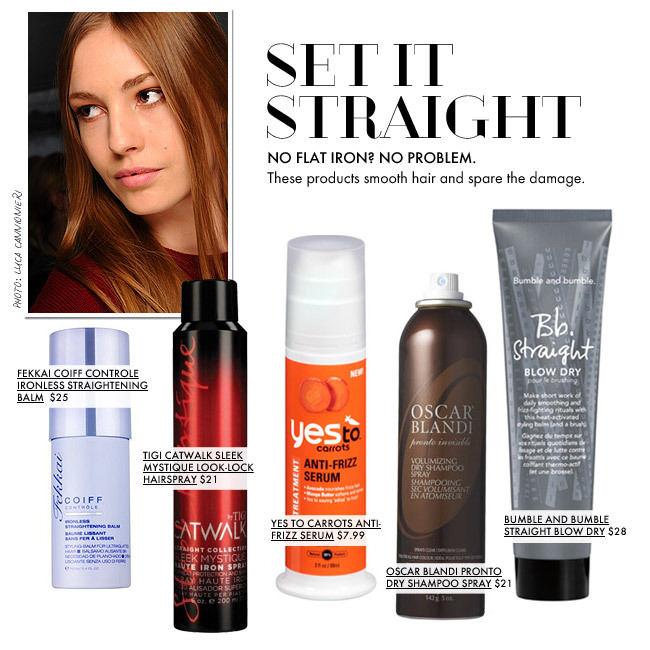 The Rene Furterer Myrrhea Anti-Frizz Silkening Fluid, $30, protects against heat damage while adding volume. Other smart tips from Quintero: use a little oil especially on the ends which are notorious for breaking. Also, don’t over use hairsprays with lots of alcohol; strands will be left greasy and flat. No matter what your hair problem is this winter, Quintero’s got you covered, as he shares his best styling products and tools to kick any bad hair day.